Inquiries for more information can be forwarded to OA@worrell1000race.org. Disappointing really. I know there were a lot of people throwing their name in the hat when it first announced, but for whatever reason most seemed to have backed out. I know a few distance races were cancelled because everyone said they would be at the Worrell. I am curious as to why. For those 4 teams that are running it, give'em hell boys and I'll be following the trackers either way! Quote Disappointing really. I know there were a lot of people throwing their name in the hat when it first announced, but for whatever reason most seemed to have backed out. ... I am curious as to why. * Communication costs are based upon team members using personal cellular programs – not the purchase of new equipment. Edited by MN3 on Apr 15, 2019 - 04:58 PM. I don't know why one would have to incur 3,700 bucks in decal work, or any number of other things, but yes. It is not cheap to race these distance races. Here locally we have the Great Texas 300 and you can easily be down thousands of dollars and that's running on the cheaper end. That said, the guys that said they'd be there know what it means to run a race like that or even run the Worrell itself. Those numbers are off by quite a bit. Parts: a single dagger board is ~$2,500 and a rudder is $700-ish. Rudder casings are ~$350 per set. Those are parts that you need to have at least one full set of spairs. Same goes for sails... What if you have a bad flip or rip a kite during a takedown? Spare spin pole, boom, mast... The list goes on. Sailing gear: $2k would get close to covering one sailor. I typically go though a pair of Gill pro full finger gloves every five days during distance races, so... I'll spend $150 in just gloves. Don't forget the PLB which will add ~$300 per sailor. Same goes for your GPS, can't have just one. Lodging: I think our estimate was a bit higher than that as well. By the time you add taxes in, I think it was closer to $175/night, but I'd have to check my race budget spreadsheet. Travel: don't forget, have to fly some people to the starting line. The expenses have grown a lot since the last time this race was run. Edited by wlrottge on Apr 15, 2019 - 05:52 PM. Competitor’s Race Apparel (Dry Suits, Life Jackets, Gloves, etc.) $2,000.00...sure, we'll assume you have some. $38k in incidentals to do this the right way. My boat costs are based on the F20carbon...that is what the organizers picked...$36k new just for the platform, mast and sails. No trailer, beach wheels, covers etc. So you're looking at a $42,000 boat that will be worth $20,000 after you run it up the beach for 15 days. Anybody wonder why the guys that said they would jump in and do it changed their mind when you need to come up with $80,000??? Yes there was supposed to be an also-ran class of F18's. Honestly there is a better chance of finishing the race on that boat, but hard for the serious guys to jump in knowing they would be second to the beach everyday behind the F20c fleet. Still, I think the right call was to go with the F18 and maybe even the venerable Nacra 20 One Design. My math says the F18 would on average be about 45min-1 hour behind the F20c. Is that time delta worth the additional ~$10k price tag over a new F18 or ~$20k price hike on a used F18 simply to run the race in the fastest 20 foot beach cat sort of available? Edited by samc99us on Apr 15, 2019 - 06:16 PM. It's only really expensive if you register. The water is there year round if you just want to sail 1000 miles up the coast. I like how the first races were just dudes challenging each other so they went out and did it on H16's from what I understand. I'm thinking of putting the spin back on my boat and doing the Daytona - Jax leg personally. Doesn't matter to me if I'm on the score sheets for that leg on the website. Quote Those numbers are off by quite a bit. Quote It's only really expensive if you register. It only counts if you enter. 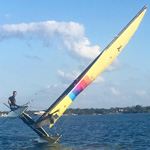 Graphics on primary sails (Main, Jib, and Spinnaker) $3,250.00 Is this a requirement? I would skip it. Graphics for application to hulls, and support vehicles $400.00 Same as above. Seems unnecessary. Daily Professional Marine Meteorologist Forecasting for Entire Race $600.00 I'll trust my predict wind app. Competitor’s Race Apparel (Dry Suits, Life Jackets, Gloves, etc.) $2,000.00 I sail on lake Michigan. consider me equipped. Lodging: A park bench will feel like a 5 star hotel after a day on the water. If I can share a small beach cat with a friend all day I can share a room with a friend at night. Secondly when I race cars I sleep in my trailer so while not a suitable option every night. I can "camp" some nights. I give up... point I’m trying to make is the trip can be executed for a lot less money. Am I optimistic or Ignorant? Kevin, you do need ground crew. They will work hard. The park bench isnt gonna cut it for them. Sure you can trim lots of fat from the above budgets, teaming up for ground crew would certainly really save money. The very large hurdle to my friends who could compete is the time required. Not many of us can swing 2.5 weeks off. 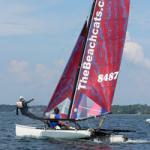 Quote Graphics on primary sails (Main, Jib, and Spinnaker) $3,250.00 Is this a requirement? I would skip it. If you're referring to the event sponsors, the individual teams shouldn't have to pay for it in addition to entry fee. If you're referring to a team sponsor, then you'd also assume to include whatever they sponsored in your totals. Hull Graphics: SI's limit team graphics to aft of the main beam. Race graphics do not cost the teams, however anything else they want to add obviously does. Hotels: Go sail that race... trust me, you want to get the best, most comfortable sleep that you can every night. You seriously have to take care of yourself from the start b/c the physical toll adds up. Once you hit the beach, the first things you want are beer/food, water, get your hands dry and taken care of and hope your ground crew can take care of the boat for you b/c you need sleep. Gear: Again, weekend warrior stuff doesn't cut it. You won't make it through this race with a wetsuit (at least not without having chafe, rash and/or fungus in places that you don't want it). Also, I'm not going to wear an old worn out life jacket or trap harness out there... have you seen the conditions? You can start the race with brand new gear... it won't look that way by the end. Forecasting: Makes the difference between winning and losing... and that isn't a joke. We do our best to run races on a shoestring, but you can't go into this half baked. We share rooms and keep things as simple as possible, but there is only so much that you can do to cut cost. I always price shop the hotels and will walk across the street if needed to save $50 a night, but you can't put a price on convenience of walking from your room to your boat fully geared up. The time savings from walking back and forth every time you need a tool or a part is huge! Quote If you're referring to the event sponsors, the individual teams shouldn't have to pay for it in addition to entry fee. sides of the mainsail in five (5) inch tall (minimum) high contrast lettering. forward of the front cross beam for the display of race and/or race sponsor(s) decals. a) Represent or depict sponsors of the Worrell 1000 Reunion Race and not individual teams. c) Be affixed to the boat hulls prior to skipper’s meeting on the first day of racing. apply, maintain and/or replace said decals as necessary. 11.9. Boats with damaged or missing decals may not be allowed to start any leg of this race. It shall be the responsibility of each team to notify race officials of damaged or missing decals as soon as possible upon completing a leg. Edited by MN3 on Apr 16, 2019 - 03:48 PM.